Big, trumpet-shaped flowers cover mandevilla plant from spring through fall. Scrolled flower buds open to reveal red, white or pink petals with yellow throats or all-yellow blooms. This evergreen sub-shrub has vining stems densely covered with glossy, dark-green oval leaves. Train your plant. Provide a trellis to support its vigorous, twining stems and to show off those glorious mandevilla flowers. Use plant ties or florist's wire to hold each mandevilla vine in place. Tie the vines loosely so that you don't restrict growth. You may have to re-tie your plant as it grows. Or place it on a plant stand or hang it up. Those leafy stems and gorgeous blooms are sure to capture attention when you display them at eye level. Let the sun shine in. Put your plant in a sunroom or by a sunny window. 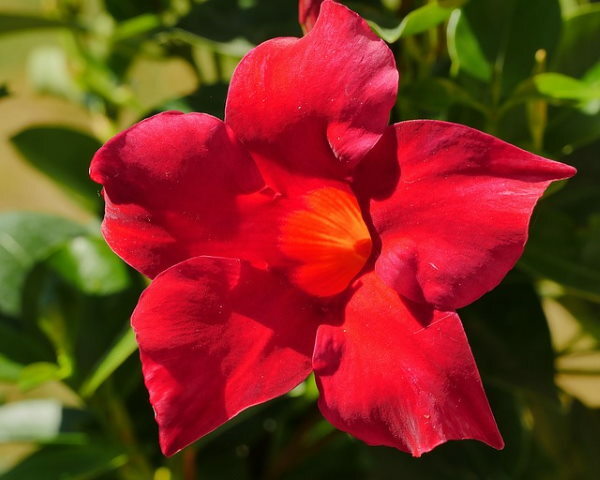 Moving your mandevilla outdoors for the summer will give it more blooming power. A semi-sunny spot outdoors is ideal. Just be sure to bring it back inside before the temperature drops to 55°F/13°C at night. Repot in spring. Mandevilla is one of the few flowering plants that grow well in a large container. Move it up 1 pot size every spring as necessary. Use a pot with drainage holes to prevent root rot. Prune it back. Unless you want a huge shrub in your home, pruning mandevilla is necessary. To control its size, prune it back in late fall -- by half when necessary. Mandevilla flowers at the tips of new branches, so you'll get more blooms this way. Pinch off spent blooms to encourage more flowers. Yellow or dropped leaves are usually caused by overwatering or too-cold temperatures. Keep your plant warm year-round and cut back on watering. Overwinter your plant indoors. Mandevilla is tropical, not hardy. Unless you live in a year-round warm climate, bring your plant inside for the winter. It will tolerate a minimum of about 55°F/13°C. Water sparingly in winter, but don't allow the soil to dry out completely. Growing mandevilla plant indoors is a little work, but worth it. You'll be rewarded with several months of bright and bold trumpet flowers. Treat it right and you'll enjoy your flowering mandevilla plant for many years. 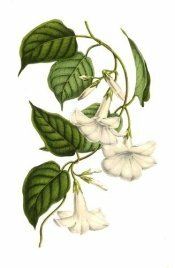 Mandevilla was formerly known as Dipladenia and is sometimes still sold under that name. 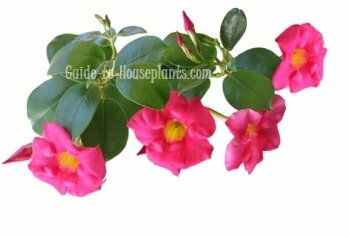 You can buy mandevilla flowers in nurseries in the spring and summer or order flowers online. Choose a plant with plenty of flower buds -- a sure sign of a healthy plant. More than 100 cultivars offer beautiful varieties to choose from. Good cultivars include 'Alice du Pont' and 'Magic Dream'. Height: 10 ft (3 m) or more if not pruned back. Light: Bright light with some direct sunlight. Plants that don't get enough light will grow tall and leggy, with few blooms. Humidity: Moderate. If relative humidity falls below 50%, mist the foliage and place the pot on a tray of wet pebbles. Fertilizer: Feed every 2 weeks with a high-potassium fertilizer while plant is growing and flowering. Propagation: Take 3 in (8 cm) stem tip cuttings in spring or early summer. Cuttings root easily in moist potting mix.